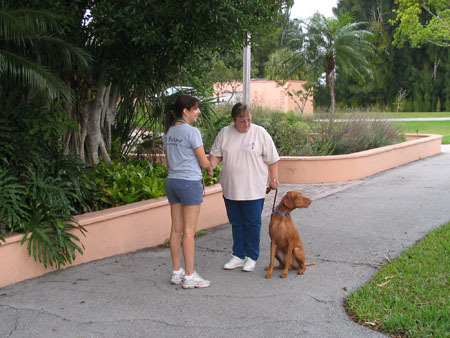 Imagine teaching your dog basic skills: sit, down, come, stay, and loose leash walking in a beautiful and fun setting. This six session class will address problem behaviors like jumping up and leash pulling to make your dog a good family member. Our positive, reward based program is a great bonding experience for you and your dog under the lovely shady trees at Plantation Heritage Park. We incorporate games and fun contests during class too! Students will learn practical skills to apply at home, outdoors and at the veterinarian’s office. Over six lessons, your dog will gain confidence and focus while learning and having fun in an enriching environment. Join us on Saturday mornings for more fun than humans should be allowed! We run classes from fall through spring. Class size is limited to 7 dogs; pre- registration is suggested. There is a 3 dog minimum to start a class. THIS GROUP CLASS IS CLASS IS NO LONGER OFFERED. PLEASE CALL 954-587-2711 IF YOU ARE INTERESTED IN OBTAINING THESE SKILLS THROUGH PRIVATE LESSONS. Wouldn’t it be great if your dog could find your keys or your cell phone? Dogs have an amazing sense of smell and a natural desire to hunt. This TWO session class focuses on teaching you how to encourage and develop your dog’s natural scenting abilities by using their desire to hunt and their love of toys, food and exercise. It’s a great class for your dog to have fun, build confidence, and burn lots of mental and physical energy. Dog reactive dogs are welcomed. 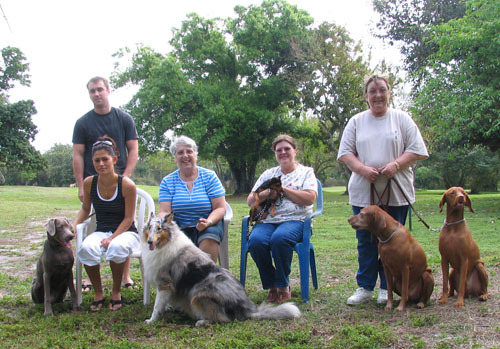 Our positive, reward based program is a great bonding experience for you and your dog under the lovely shady trees at Plantation Heritage Park. K9 Fun Nosework focuses on using positive reinforcement to create challenging searching exercises your dog will love. Nosework is a great tool to work with dog reactive dogs. There is a 3 dog minimum to form a class. Join us on 2 consecutive Saturday mornings for more fun than humans should be allowed! There will be 5 working slots open for owners and their dog at $50. Owners joining the class without a dog may observe for $20. Bring our your dog’s inner star! Teaching tricks are not only fun for owners but also help to mentally stimulate your dog’s brain. Tricks are also a great way to build your dog’s confidence and can help the human/canine bond. Don’t miss out on this opportunity to teach your dog some new and fun behaviors! Call us if interested and we will put together a class. Join us on Saturday mornings for more fun than humans should be allowed! What to Bring the First Day of Class? We want to help you enjoy the company of your dog to the fullest. There’s nothing a dog can’t be taught to make it a better family member. Call us today for a free phone consultation and dog-training estimate.